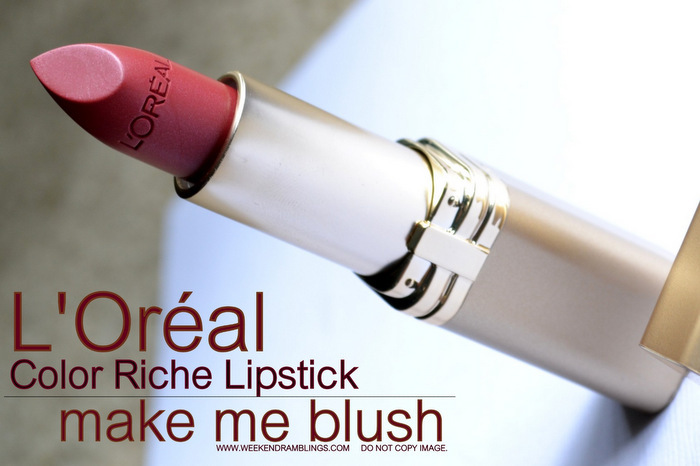 Creamy, rich, and moisturizing, the L'Oreal Color Riche lipsticks are some of my favorite lipsticks. They feature moisturizing ingredients like argan oil, omega-3, and vitamin E to keep lips nourished and hydrated and are available in 54 colors, so there's definitely something for everyone there. 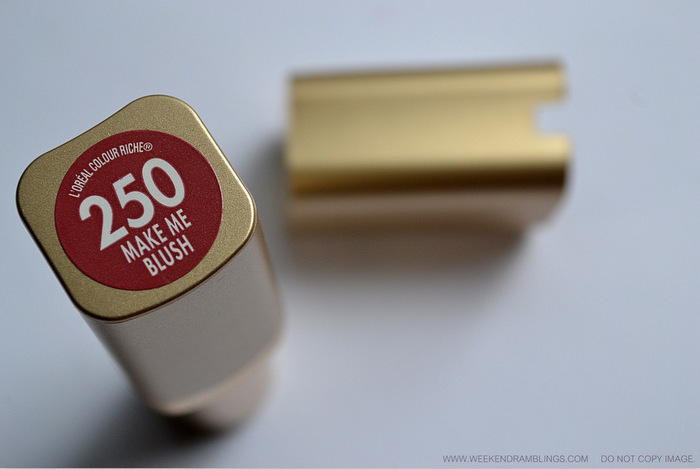 The shade I am reviewing today is L'Oreal Color Riche lipstick in Make Me Blush (250) - a reddish pink color with maybe a teeny bit of brown to it. The packaging is a dull bronze-gold with a subdued matte finish to it. 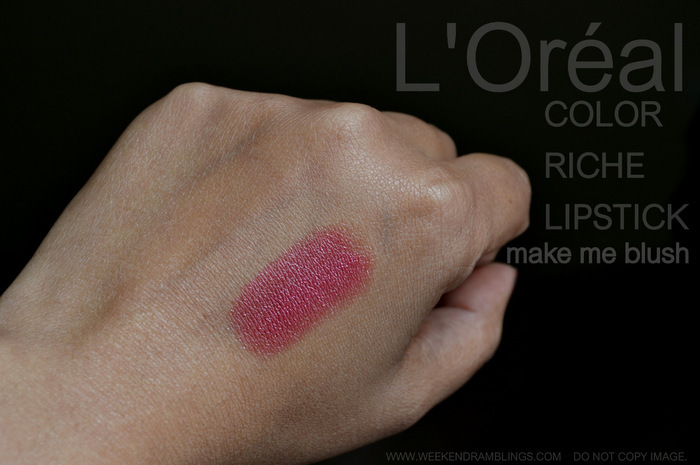 As with all L'Oreal Color Riche lipsticks I have tried so far, this too has a strong rose-ish fragrance to it. 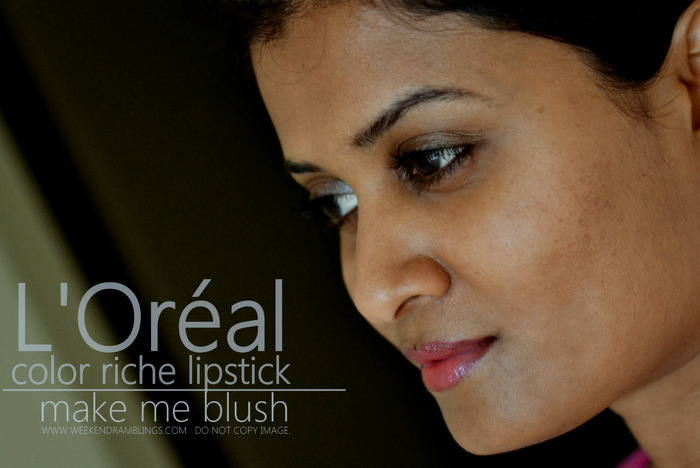 A creamy reddish pink shade with a hint of brown to it, this does not have any shimmer or frost in it. Applied with a lip brush, this goes on a teeny bit sheer and lets the natural lip color show through a bit, though this won't be a problem unless you have really pigmented lips like I do. Just apply it directly from the tube if you want more opaque coverage. Ohh the color looks gorgeous! I love the Color Riche range! You should wear this more often, it looks lovely on you! Wow! Looks lovely on you :) will def buy this one! LOL seriously, I'm considering leaving the Burberry open for a bit until the fragrance leaves. It will dry out the lippe a little no? 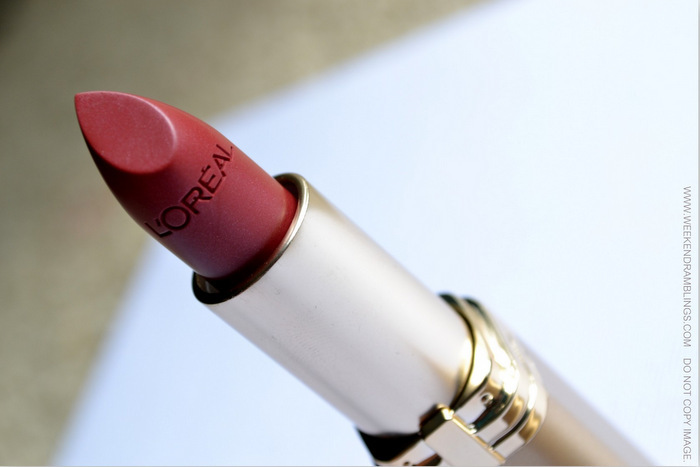 Amazing shade :) Looks very pretty on you.